Sustainability is a new way of thinking about an age-old concern: ensuring that our children and grandchildren inherit a tomorrow that is at least as good as today, preferably better. There was a time when conventional petroleum-based plastic dispoables were the latest, greatest solution to every day living — convenient to use and easy to dispose of. But the proliferation of disposable plastics has come back to haunt us, from overflowing landfills and oceans polluted with plastic refuse, to dwindling oil supplies and rising costs. Are the resources used to make it nature-based and renewable? Is its product life cycle sustainable, from material sourcing to manufacture to disposal and recyclability? Where is it manufactured and how does that affect carbon footprint? 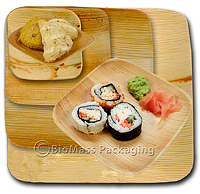 For the manufacture of disposable foodservice products, we think using annually renewable, plant-based resources is far more sustainable than using limited (and toxic) fossil fuel-based resources that, through extraction and processing, are environmentally damaging. Retrieving agricultural waste that would otherwise be incinerated, using wood pulp fibers from sustainable tree plantations following good forestry principles, and harvesting crops not grown for food use are examples of sustainable sourcing for our products. A product’s life cycle is a key way to determine its sustainability. A life cycle assessment (LCA) can help determine if a product meets certain standards of sustainability. Cradle-to-cradle is a specific kind of cradle-to-grave assessment, where the end-of-life disposal step for the product is recycling, which includes composting. The recycling process can originate new, identical products (e.g., new PET plastic bottles from collected PET plastic bottles), or different products (e.g., reusable fiber tote bags from collected PET bottles). Composting is a form of disposal, where products are allowed to breakdown (e.g. 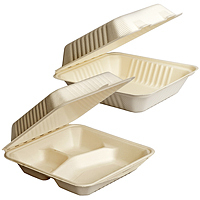 bioplastics in a municipal or commercially managed facility under optimum conditions, or cellulose film in a home compost environment.) The compost can then be returned to the earth to encourage new crop growth, completing not only the product life cycle but the carbon cycle as well (carbon neutrality). Additionally, Life Cycle Inventory (LCI) analyzes flows from and to nature for a product system, including inputs of water, energy, and raw materials, in addition to releases to air, land, and water. Also evaluated is the significance of potential environmental impacts. How much water is required for production anddoes it recycle back into the process? How much fossil fuel energy is required for production? Does manufacture include a closed loop process? Are chemicals used? What type? Are workers treated well and paid fair wages? For example, Bridge-Gate uses a chemical free, zero pollution process which requires very little water and employs a completely self-contained washing system. Once their pulping process is complete they pump the material directly into production of their finished goods. By eliminating the pulp drying process, less energy and less water is used. Their factory does not employ children, and pays its workers fair living wages according to living standards in China, and provides housing, regular meals and regular hours for its workers. VerTerra™ production begins with collecting fallen leaves, which are then high-pressure sprayed with water, steamed and UV sterilized. Over 80% of the water used in production is recaptured and reused. And the company has created hundreds of fair-wage jobs for local craftspeople who work in conditions compliant with international standards. Where companies locate their production facilities also factors into sustainability. Is the product domestically produced? How far apart are resources and manufacturing facilities? How much fossil fuel is required to transport raw materials to factory, and finished goods to distribution points? How efficient are the packing and shipping processes? In the case of Ingeo™ PLA, the dextrose used to produce it comes from field corn grown within a 300-mile radius of NatureWorks’ Blair, Nebraska, facility. Bridge-Gate strategically located their factory in close proximity to where their raw materials are grown and harvested. Less fuel is required to transport them than would be required to truck pulp sheets from remotely located paper mills. EcoTensil and EcoTaster spoons are made from far less material than their plastic counterparts. Five thousand spoons can fit in the same size box as one thousand plastic or bio-based spoons. And because they pack tightly and are made in the USA, they leave a smaller carbon footprint in transit. For inclusion in our BioMass Packaging catalog, we often consider whether a particular product, multiplied on a grand scale, can have a positive, rather than negative global impact— environmentally, socially, economically. One of our favorite examples is a product we call The Good Cup. Novel in the industry, we think this R4 cup is a great, sustainable solution that solves the problem of consumers pouring good coffee down the drain. 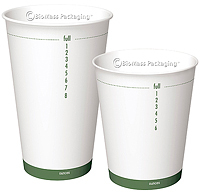 To-go cups are typically filled to the brim leaving little room for cream, which forces customers to pour an ounce, or more, of coffee into the garbage before they can add milk or cream. With the R4 cup, “May I have a large coffee with room for two?” is all they need to say. The cup is filled only to the second line, leaving room for two ounces of milk or cream. Coffee drinkers get a better cup of coffee, retailers stretch the value of the coffee bean, and we all benefit from a more efficient use of fresh water. Throwing coffee away to make room for cream when a cup has been overfilled has an environmental impact around the world. This action, repeated everywhere and all the time, adds up to countless gallons of water thrown away and results in the global need for more water to grow more coffee beans. The economic impacts to the coffee business owner include: greater costs for water, beans and energy because they have to make more coffee; increased disposal costs to haul larger amounts of garbage that include liquid. This innovative R4 system not only saves water, coffee and energy, it also improves the customer experience. Whatever your definition of sustainability, we can all agree that putting this concept into practice is important to our future and the planet’s. Preserving the environment for future generations takes efforts that start here and now. And consumers are realizing this more and more every day. Demand for sustainable alternatives continues to grow. And businesses that respond to that demand are doing the right thing, in many ways. Not only is going green good for the environment, it also boosts company morale and conscience. Businesses can also reap financial benefits from positive publicity, customer appreciation and loyalty, increased sales and even decreased operating costs. Making the transition from traditional foodservice supplies to sustainables can generate great returns on investment — environmental and economical — now and in the future. Let BioMass Packaging show you how to green your business. Just give us a call, we’re here to help!